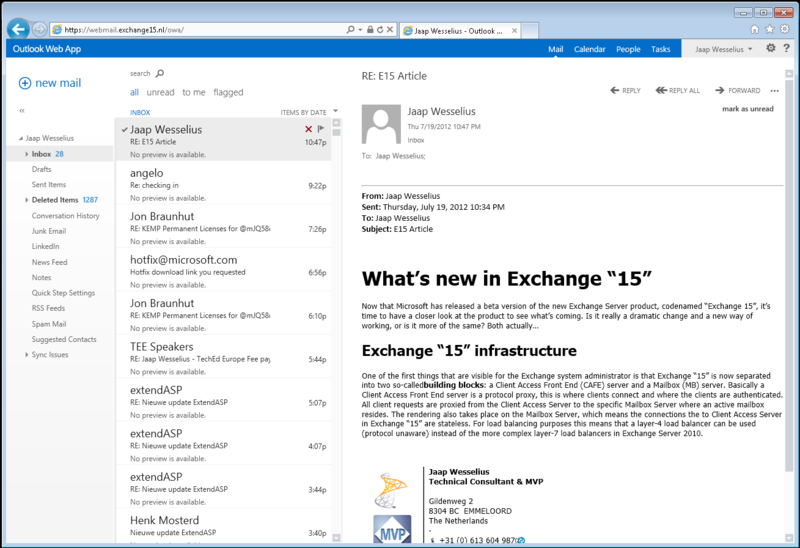 The Beta of Exchange Server "15" shows considerable improvements in the ease of management and installation. It has been extensively re-engineered to make it more effective in working across several datacentres. It also has a new Outlook Web App that even allows offline working. 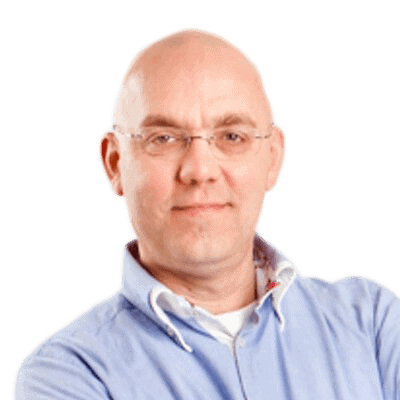 One of the first things that are visible for the Exchange system administrator is that Exchange “15” is now separated into two so-called building blocks: a Client Access Front End (CAFE) server and a Mailbox (MB) server. Basically, a Client Access Front End server is a protocol proxy. This is where clients connect and are then authenticated. All client requests are proxied from the Client Access Server to the specific Mailbox Server where an active mailbox resides. The rendering also takes place on the Mailbox Server, which means the connections to the Client Access Server in Exchange “15” are stateless. For load-balancing purposes, this means that a layer-4 load balancer can be used that is protocol-agnostic, instead of the more complex layer-7 load-balancers in Exchange Server 2010. Somehow this sounds familiar, since the idea is very similar to Exchange 2003. The server capabilities as we know them from Exchange Server 2010, such as Mailbox, Hub Transport, Client Access and Unified Messaging, are still available but they are now combined in the two building blocks. However, instead of the tight coupling we had in Exchange Server 2007 and Exchange Server 2010, the building blocks are now ‘loosely coupled’. This makes it more flexible. In Exchange 2010 it was not really possible to access a CAS server in “datacenter one” when your mailbox was in “datacenter two”, but this has improved. The Edge Transport server in Exchange “15” is not yet available, but Exchange “15” can use the Exchange Server 2010 Edge Transport server, including Edge Synchronization. As an alternative to using an Edge Server, Microsoft is working hard on Forefront Online Protection for Exchange (FOPE) which has been rebranded to be called Exchange Online Protection (EOP). A major difference between earlier versions of Exchange server is that direct MAPI connections are not longer supported. MAPI is still used, but it must be encapsulated in RPC/HTTPS. The advantage is that the number of required namespaces is reduced (for example, the FQDN of the CAS Array is no longer used) and there’s no need anymore to provide affinity for the RPC Client Access Service, though this is only important for large high availability deployments of Exchange server. Another note from a client perspective: only Outlook 2007 and higher are supported with Exchange “15”. Outlook 2003 and earlier are NOT supported. Speaking of older versions, Exchange “15” in its current public beta build does not support coexistence with earlier versions of Exchange server. Of course this will change in the RTM version of Exchange where coexistence with Exchange Server 2010 and Exchange Server 2007 will be fully supported. It is important to note that there’s no support for coexistence with Exchange Server 2003! In Exchange Server 2010 there’s a single Information Store process (store.exe, using multiple threads) running on the Mailbox Server. This single IS process is responsible for handling the Mailbox Databases on the Exchange Server. In Exchange “15” the Information Store process is fully rewritten in C#, so it’s all managed code. Each database now has its own worker process which means that, for every database that’s mounted, a separate instance of the store is started. ‘Big deal!’, you might say, but the advantage is that, if one store instance crashes and dismounts the accompanying database, the other databases are not affected. In Exchange 2010, when store.exe crashes then all databases will crash, so this is a major improvement! Figure 3. Multiple databases mean multiple independant store processes! And for all you database aficionados, Exchange continues to leverage the Extensible Storage Engine (ESE) as its database engine. 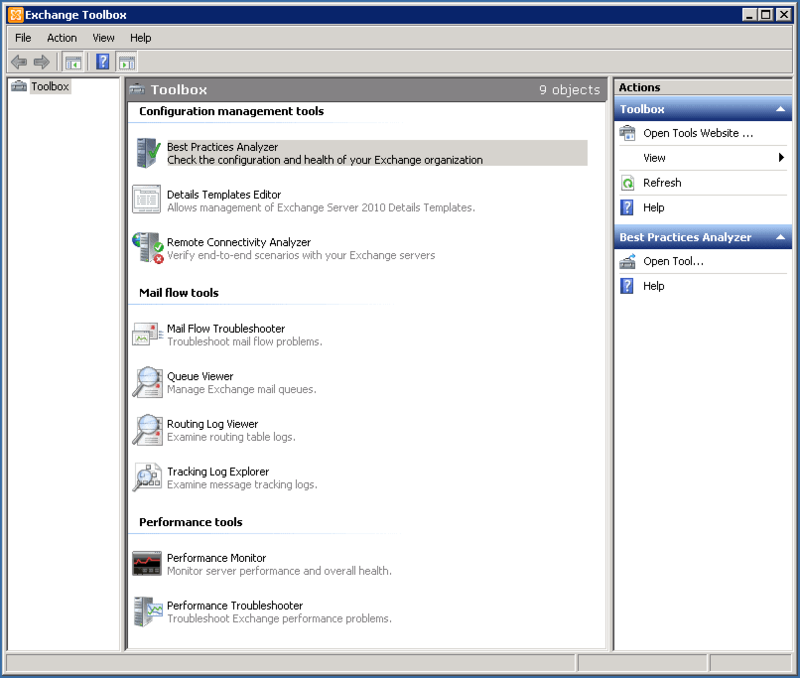 The Exchange Management Console in Exchange Server 2010 is not the best application to work with in order to manage an Exchange environment. Although most options are available, it is very slow due to the usage of remote PowerShell, and available options are not always consistent in the various panes. The Exchange Management Console is no longer available in Exchange “15”. There still is an MMC plug-in, but it only contains the toolbox, basically the same toolbox that is available in Exchange Server 2010. The Exchange Management Shell is still available, and all management can be done from the shell. Completely new is the Exchange Administration Center (EAC), an HTML based management option which is the successor of the Exchange Management Console. In the EAC you can manage recipients, servers, mailflow, and organizational settings for both an on-premises Exchange deployment as well as for an Office 365 deployment. It takes some time to get used to after working with the old Exchange Management Console, but it works well, after you get used to it. The EAC is for the sysadmin; individual users still have access to the Exchange Control Panel (ECP) for managing their personal data. But since we are still in beta, not all functionality is available in the EAC. Some functionality may be added, but at the same time some functionality may be removed. Only after RTM (Release To Manufacturing) will we know exactly what functionality is available! Team mailboxes are Microsoft’s implementation of “Exchange and Sharepoint: better together”. A team mailbox is a mailbox targeted toward (project) teams where data can be stored and accessed by team members, so at the same time it is also a shared mailbox. The team mailbox is actually a combination of an Exchange Mailbox and a SharePoint site. The mailbox provides all the logic like owners and members, the SharePoint site provides the shared storage. The advantage of a solution like this is that you only use one client to access both kinds of data, so the individual messages are retrieved from the mailbox while the documents are retrieved from a team mailbox (which is some sort of team site under the hood) with only one (Outlook) client. Ever since Exchange Server 2007, Microsoft seems to have been trying to get rid of Public Folders. Unfortunately for Microsoft, most customers did not agree with this because they felt that Public Folders are quite an important tool. In Exchange Server 2010 there were some improvements in Public Folder management although it was still not like Exchange Server 2003. Overall, however, it was still a sad story. For Exchange “15”, Microsoft had to make a choice: either completely cut Public Folders, or do a re-engineering of the product. The decision went in favour of the latter and Microsoft has re-built Public Folders from the ground up! Public Folders have moved from their own Public Folder Database to Mailbox Databases, so in Exchange “15” you will no longer find Public Folder Databases. The hierarchy, i.e. the logical structure of Public Folders is stored in one or more hierarchy mailboxes. The Public Folder content is stored in one or more Public Folder mailboxes. 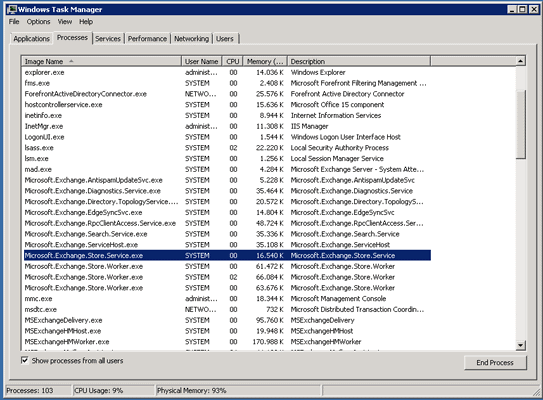 The Exchange servers contain a so-called ‘stub’ for Outlook clients. This stub makes Outlook clients believe there are traditional Public Folders available. So, from a client and end-user experience, nothing has changed, but under the hood Public Folders are completely re-engineered. What are the implications of moving Public Folders into Mailbox Databases? In earlier versions of Exchange, Public Folders had their own replication, availability, and recovery mechanisms (or challenges, if you want to look at it that way). These have all gone, and Public Folders can now fully utilize Database Availability Group options, both for availability and recovery purposes. In the Clients and Coexistence section, I already shared with you the fact that Exchange Server 2003 and earlier are no longer supported. This statement has a bigger impact than one would think: Outlook 2003 and earlier versions use Public Folders (System Folders to be precise) both for Free/Busy information and for the Offline Address Book. With the disappearance of Outlook 2003, System Folders are no longer available in Exchange “15”. Free/busy information and the Offline Address Book are only available as web services in Exchange “15”. Autodiscover, web services, and certificates are becoming more and more important for every Exchange administrator! It is important to note the fact that, although Public Folders are completely re-engineered, it is still possible to use Exchange 2010 Public Folder server in an Exchange “15” environment. One of the most compelling features in OWA “15” is however the offline feature. Yes, that’s right; OWA will now have an offline feature. This makes it possible to use OWA while you are travelling! There are some limitations though; like ActiveSync clients, you’ll only have a limited amount of items available in your inbox (couple of days-worth), there’s no offline access to archived folders and mailbox search does not work in offline OWA. Browsers that support offline access in OWA are the major browser vendors that support the HTML 5 offline standards. Examples are Internet Explorer 10, Safari 5.1 and Chrome 16. Microsoft recently released a beta of Exchange Server “15”, the successor to Exchange Server 2010. 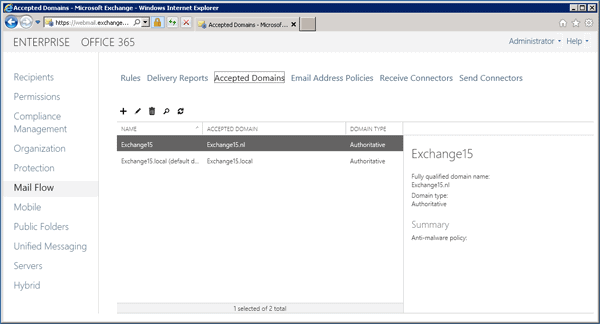 There are a lot of promising and compelling features in Exchange Server “15”. From an Exchange system administrator’s perspective, there are major changes in management. The Exchange Management Console has disappeared and been replaced by the Exchange Administration Console, though the Exchange Management Shell is, of course, still there. There are major improvements in the overall architecture, thereby making it relatively easy to implement multiple datacenters. From an end-user perspective there are new features such as the team mailboxes, renewed Public Folders and a new look and feel for OWA. And don’t forget the offline availability in OWA. 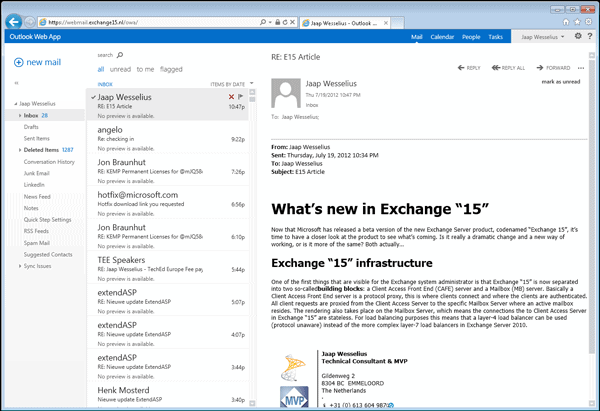 There are certainly enough reasons to have a close look at Exchange Server “15”. 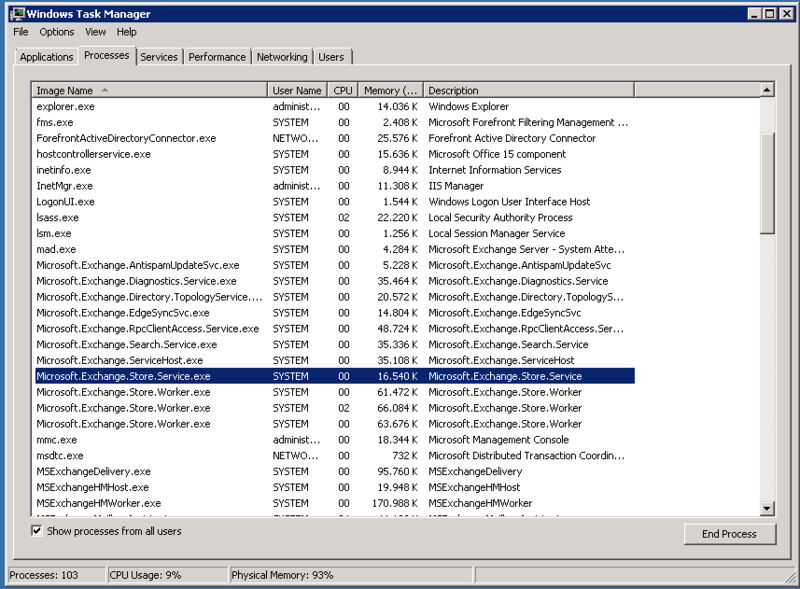 If you have a large Exchange 2007 environment and want to start migrating to Exchange Server 2010 later this year maybe you should think about waiting some more time for Exchange Server “15”. I think it’s worth the wait! A publically available Exchange “15” preview can be downloaded here.